households | Strategic Networks Group, Inc.
Household uses of the internet are often seen as lifestyle enhancements or conveniences, such as online entertainment, social networking, paying bills, or simply browsing for information on topics of inetrest. However, a significant number of households also use the internet to generate income, ranging from small amounts of supplementary income to full time home business income. 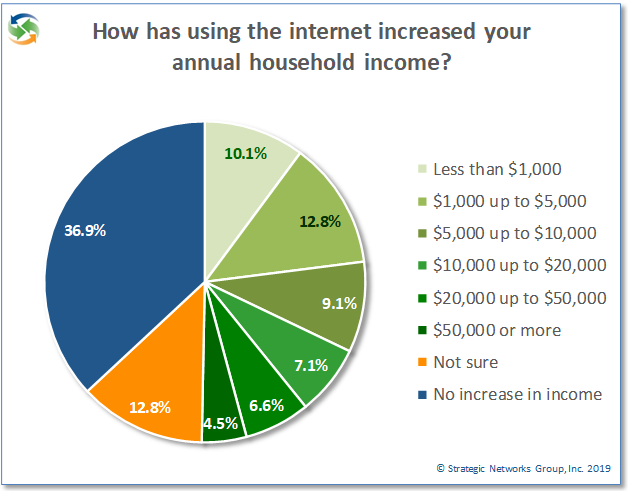 SNG’s research of more than 18,000 households shows that 89% have a personal web presence and, while the majority use this for personal or professional networking, more than 30% of these households use their web presence to generate income. Overall, more than 50% of households report that the use of broadband has enabled them to increase their household income in one way or another. 29% earn substantial supplementary income of between $1,000 and $20,000 annually, while another 12% earn more than $20,000 annually. At whatever level of additional income, it can make a huge difference to the lifestyle of most people, and households are finding ways to use the internet and their broadband connections to make it happen. 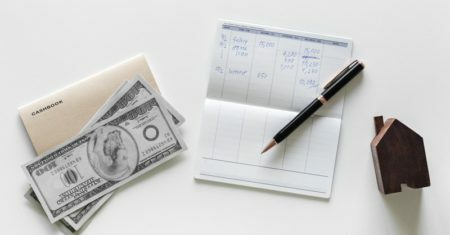 The two most obvious ways that the internet and broadband connections can be used to generate household income are teleworking and home-based businesses. These create income directly from employment and from business activities respectively. However, even excluding these households more than 41% of the remainder still generate additional household income online in amounts large and small. It is no surprise, then, that more than 50% of households see the ability to work from home as a significant benefit of broadband, and 37% say that the opportunity to earn additional income is a very significant benefit. While there are many other lifestyle benefits from broadband that rate higher across all households, one should not underestimate the significance and impact of how many households use broadband to create household income. When you have income generation, access to the internet with quality broadband becomes much more than a “nice to have”. Households see the value in this and community leaders need to recognize this as well. In fact, the likelihood of relocating for quality broadband is significantly higher for those generating income online compared to households that do not. These are innovative households that communities can ill-afford to lose. While earning additional household income is significant, the majority of working households still have one or more members employed at jobs, either at an employer establishment or by teleworking. Having access to quality broadband helps households improve their employment in two important ways. First, broadband provides access to online training and education for enhancing skills and learning new ones. Second, with access to a world of opportunities the internet helps people find better jobs, including the ability to telework rather than relocate. More than 45% of households use the internet for education or training courses. Of these, 45% strongly agree that online education provides access to more learning opportunities and more than 30% say that online training enabled the completion of a degree or certification. It is significant that broadband can make such a potential difference to the livelihood of one in seven households. Of those households that had a member finding new employment, 73% said that using the internet helped them to gain better employment in higher-skill or higher-wage jobs, with 20% of those households using telework. Broadband enables people to enhance their skills wherever they live and to find better employment while remaining in their community. 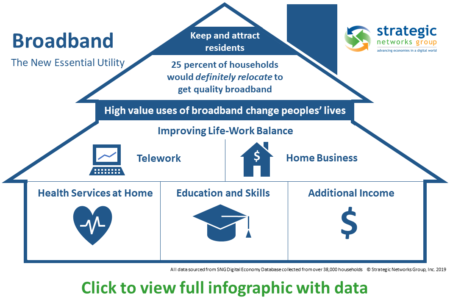 These benefits of broadband do not impact every household since not everyone is equally motivated to follow these paths, but broadband makes it possible for those who do. See what broadband means for a rural county and how they got the support and funding to build the digital infrastructure they need to thrive – Custer County Broadband Impact and Market Assessment. Find out more about SNG Solutions for Local Economic Development. Teleworking is not for everyone, nor is it available to everyone in their job. However, a growing number of people telework part or all of their work week. We define telework as working at your job from home in a formal arrangement with the employer during normal working hours, as opposed to simply accessing the workplace remotely on an occasional basis or while traveling. Teleworking offers tremendous potential for people to be employed in the type of job they want and to live in the community they prefer, but to telework effectively people need robust and reliable broadband connections. So, what is the current state of teleworking and what is its impact on teleworking households and the community? SNG has compiled important teleworking insights from research of over 18,000 households. Nearly one in four households (24.4%) include one or more teleworking members. An additional 38% of households access the workplace from home on an occasional basis. These numbers increase to 31% and 46% for employed, working-age households. The vast majority of those employed use home internet for work reasons to some degree. There is a significant difference between urban and rural households in accessing the workplace from home. Occasional workplace access is 6 percentage points lower for rural households, and teleworking is 9 percentage points lower. There can be a number of reasons for this difference, but one factor is the availability and quality of broadband in urban versus rural communities, as discussed in our research brief on household broadband. While teleworking offers the same benefits whether in an urban or rural community, it can be of particular value to rural residents who have a more limited range of local employment opportunities than their urban counterparts. 44% of teleworkers spend at least 4 days per week working from home, with an average of 3.2 days per week teleworking. The average one-way commute avoided is 60 miles (100 km) with almost one-third of teleworker living more than 60 miles from their employer workplace. Those with more distant commutes tend to telework more days per week. Nearly 75% of teleworkers say that reducing their time commuting is a very important benefit. This not only reduces commuting time, but reduces costs for fuel and car maintenance while reducing traffic, road wear, and fuel emissions. Teleworking is not merely a convenience and cost saving for households, although these are important benefits. More than half of teleworkers strongly agree that their ability to telework in their job helps in achieving their career goals. 40% strongly agree that they would not have their current job were it not for teleworking and 31% strongly agree that they would need to relocate for their job if they could not telework. The significance of this for communities is that those households who may want to telework and have the opportunity to do so may need to either forgo those employment opportunities or relocate out of the community if they do not have the quality of broadband they need. By the same token, those who may want to locate into the community for its other attractions will be inhibited to do so if the available broadband does not allow them to telework effectively. While teleworking only impacts a portion of the population, it is a significant portion and a lack of quality broadband can have noticeable consequences for attraction and retention of households. Not only is the teleworking household segment a significant percentage of the community, it is a highly valuable segment. 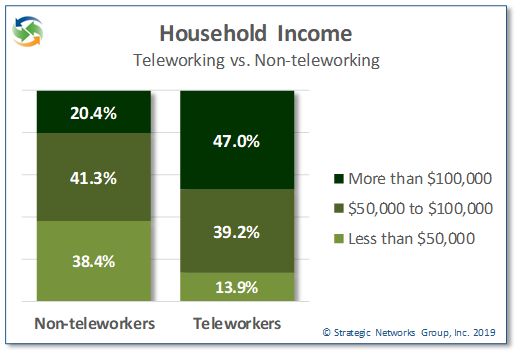 Teleworking households have significantly higher incomes than non-teleworking households, with 47% having a household income of more than $100,000 per year compared to 20% of non-teleworking households. 86% earn more than $50,000 per year. Households with higher incomes spend more locally, own more valuable properties, and pay higher taxes locally. While communities cannot create teleworking employment opportunities for residents, ensuring that they have the quality broadband needed sets the stage for having more residents telework and stay in the community, as well as attracting new teleworking residents. Teleworking delivers benefits not only to those teleworking but also to the community by giving residents the option to find or keep the job they want while remaining in their community of choice. By working from home, teleworkers spend more time in their community, buy more locally, and are more engaged in the community. Communities that ensure they have quality, robust broadband provide a platform for teleworking and open up more opportunities for their residents and for attracting new residents. See what teleworking means for a rural county and how they got the support and funding to build the digital infrastructure they need to thrive – Custer County Broadband Impact and Market Assessment. Access to robust and competitive broadband is essential for any community to survive, let alone thrive. Unserved or underserved areas continue to exist in many localities, whether because of limited or no choices for service providers, outdated technology, etc. This research brief provides some insights and data points on the current state of access for households, with focus on rural communities and how they compare to urban areas. From SNG’s research of over 19,000 households across the North America we are able to reveal some of the important findings that proponents of broadband need to know. These insights are from household data collected directly by SNG rather than statistics provided by service providers or other agencies. While fiber deployment and use are increasing, cable remains the dominant broadband technology overall with 23.6% of households, followed by DSL at 19.6%. However, the picture changes when you compare urban and rural areas. 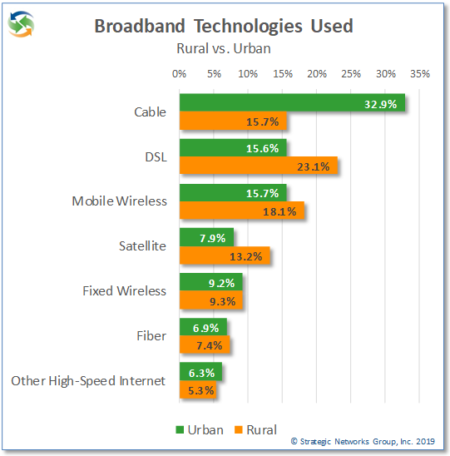 While cable dominates urban markets, DSL is still the most used technology in rural areas – which suggests that this is due to the lack of other available options. Fiber use is low for both urban and rural households. For rural areas in particular, the lack of cable and fiber options drives up the use of mobile wireless and satellite as an alternative. From a user perspective, technology is only relevant for its impact on connection speed, reliability, and price. Understandably, much emphasis is put on speed of connection, since this is how services are sold. However, when it comes to how households prioritize their selection of service, reliability is cited as highest priority with 88% of households compared to 77% who say speed is a high priority and 66% who say affordability is a high priority. These priorities are almost identical between rural and urban households. So, if that is what households expect, then what is available and how do they feel about the connections they have? More than half (54%) of households have only one broadband provider available, clearly indicating a lack of choice for most households. For rural areas nearly 62% of households have only one broadband provider to choose from, with implications for competitive service price and quality. This is reflected in rural service speeds, price, and satisfaction. On average, rural households get approximately half the download speed as urban households and just over one third the upload speed. When it comes to meeting current FCC speed recommendations, 28.7% of urban households meet or exceed the recommended 25 Mbps download and 3 Mbps upload speed, while only 17.2% of rural households do so. Even looking at the old FCC recommendation of 10 Mbps down and 1 Mbps up, just over one third of rural households meet those speeds. More than 61% of rural households get less than 10 Mbps download speed for an average cost of $70 per month. Overall, rural households pay a monthly cost of $4.38 per MB compared to $2.32 per MB for urban households, almost double the cost. Rural households have less choice and slower speeds and spend more for the same or poorer service. 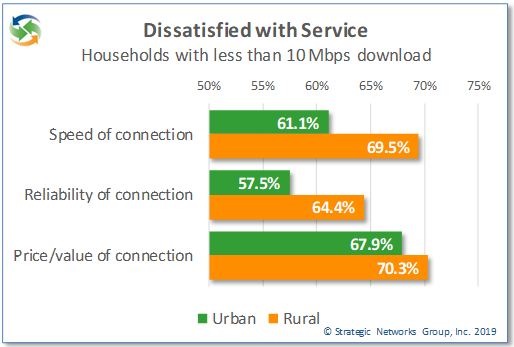 As a result, 70% of rural households subscribing to less than 10 Mbps download speeds are dissatisfied with the value of their service for the price they pay, and 69% are dissatisfied with the speed of service. In addition, 64% of households are dissatisfied with the reliability of their service. The satisfaction levels are only slightly better for urban households with less than 10 Mbps download, with 68% dissatisfied with value, 58% with speed, and 68% with reliability. This is partly explained by the different mix of technologies deployed in rural areas. With a higher proportion of DSL and satellite connections used in rural areas the quality of speed and reliability is reflected in overall satisfaction levels, resulting in lower satisfaction with value for the price of the service. Fiber connections generate the highest satisfaction levels by far, followed by cable service. 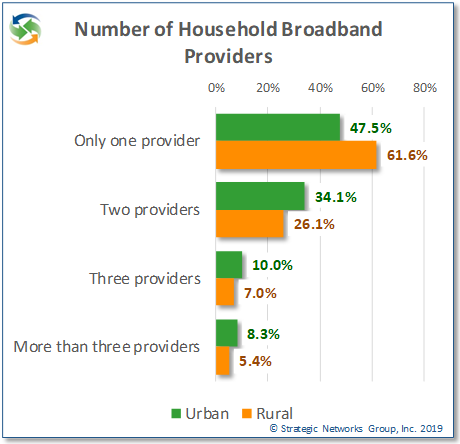 Very few households are fully satisfied with DSL or satellite services, and yet for some these are their only options for broadband connectivity. 34.7% of households say that their fiber connection is “worth every penny” for value satisfaction, compared to 7.6% for cable, 4.6% for DSL, and 2.0% for satellite. Another 48% say the value of fiber is “acceptable for what I pay”, versus 38% for cable, 27% for DSL, and 15% for satellite. Similar satisfaction levels by technology are shown for connection speed and reliability. More than any other technology, fiber is clearly a solution that meets household priorities and expectations. Households without good broadband available to them may choose not to take any of the options forgoing the speed and reliability they need. Households in this situation will not use the internet to its fullest capacity, missing opportunities for them to fully benefit from what the internet can offer – such as new income opportunities, remote access to health care and education. This negatively impacts community well-being as inadequate broadband risks losing population and difficulty in attracting new residents and businesses. This is particularly challenging for smaller, rural communities where SNG research has shown that they are more likely to lack quality broadband and have the most to lose in terms of population decline, especially among youth. See how a rural county got the support and funding to build the digital infrastructure they need to thrive – Custer County Broadband Impact and Market Assessment.